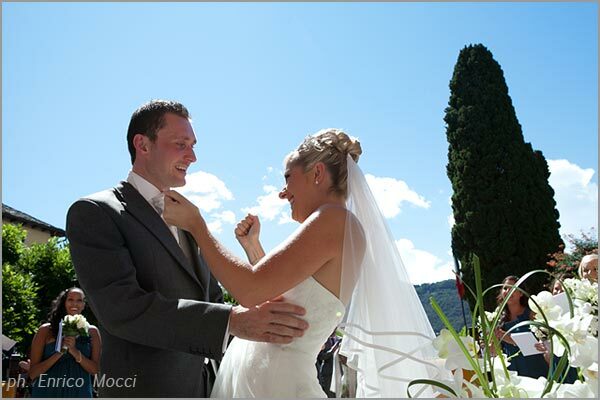 Today is the third time we come back to talk about the marriage of Charlotte and Steven: several months have passed since that July 29th, 2011, but still all of us are keeping a feeling of that fascinating and unforgettable event, certainly one of the most impressive organized the last year on Lake Orta. To get an idea of the special charm and atmosphere of that day, do not miss the trailer video made by the Studio ArteFotoArona of Enrico Mocci… a 3 minutes video simply spectacular! 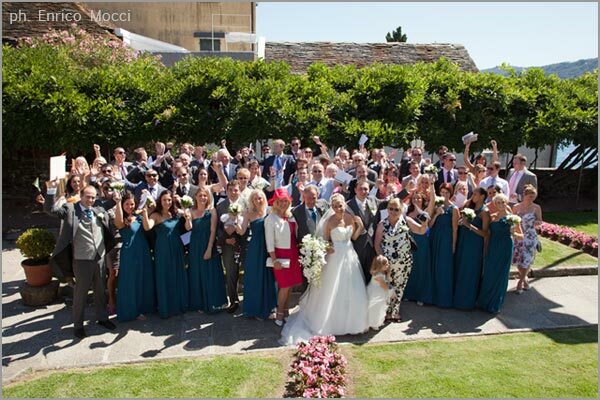 The wedding of Charlotte and Steven has been a fascinating and unforgettable event for different reasons: first of all it was a beautiful sunny day with very pleasant temperatures, although it was full summer! 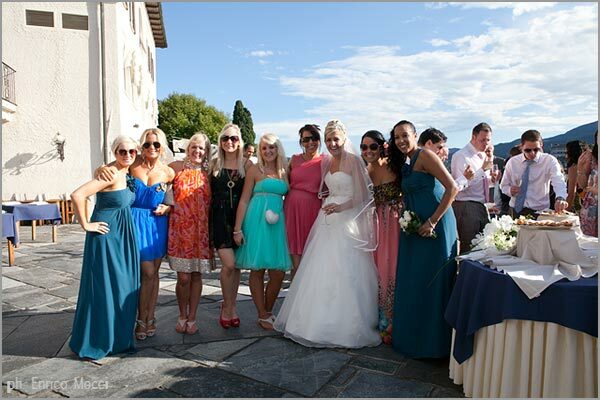 The protagonists, Charlotte and Steven with their charm, always smiling and enthusiast, the 8 bridesmaids, who accompanied the bride (a real record for the Lake Orta!) had a real enchanting scenary: the original choice for a mini-cruise on the lake by the boat Ortensia – ideal for all guests who would like to enjoy the amenities of lake Orta – and especially the outdoor party organized on the beautiful terrace by the lake of the Hotel San Rocco with its gorgeus view of the San Giulio Island. 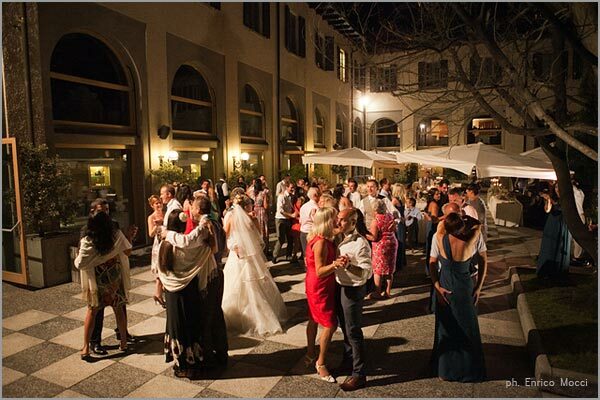 On the other hand, when talking about a wedding in Orta San Giulio, the Hotel San Rocco is the best choice in terms of elegance, position and charm. 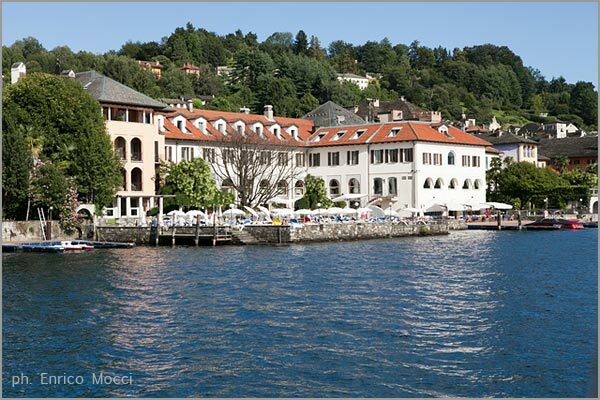 It is located on the lakeshore, in the heart of Orta, where once was a cloistered convent. The Hotel San Rocco offers high level facilities including: a well-known restaurant, whose kitchen is directed by the famous chef Paolo Viviani, a delightful lounge bar overlooking the lake, 80 rooms recently redesigned (most of them with terrace or balcony lake view), a Wellness Roof Garden on the roof terrace of the Hotel, the exclusive Body Harmony Centre and of course the lake terrace with the panoramic outdoor swimming pool where Charlotte and Steven celebrated their great day on Lake Orta. 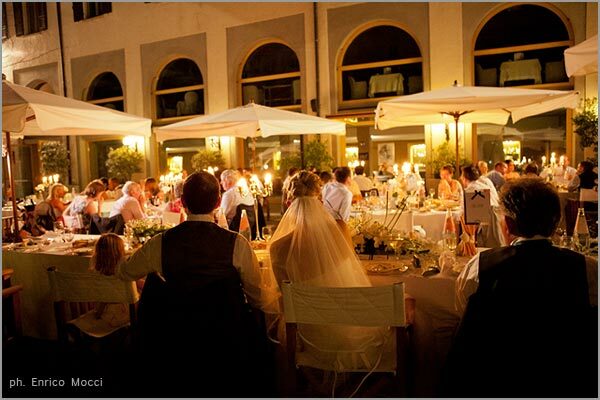 The Hotel San Rocco has been the core of the entire event: first of all for the accomodation of all guests coming from U.K. and of course for getting the bride ready. 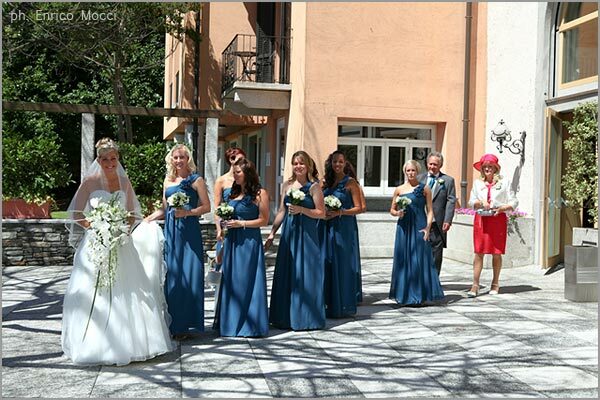 Here is Charlotte in her room (see below) surrounded by 8 bridesmaids and the flower girl, just before getting to Villa Bossi, where the civil ceremony was expected. Villa Bossi is two minutes walk from the Hotel San Rocco but the most attractive way to get there is by rowboat. Most of our brides choose this solution! ?The Hotel San Rocco has an accessible dock for boats and speedboats; by rowing boat, Villa Bossi is reachable in less than 5 minutes. 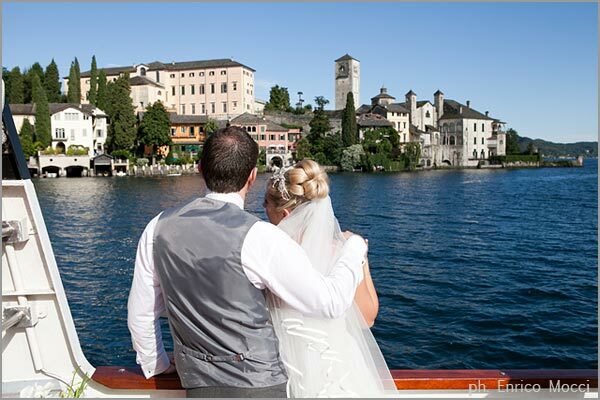 The arrival at Villa Bossi by rowing boat is the right choice also for a scenographic effect: the photograph of the bride in the rowing boat, with the Island of San Giulio in the background is now a must have for the weddings on Lake Orta! 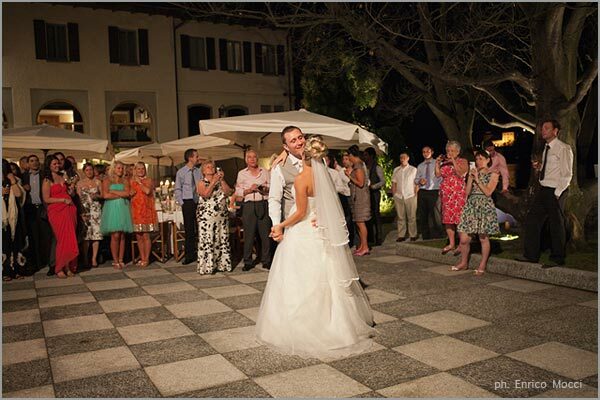 The atmosphere of a wedding at Villa Bossi has always a special charm that only a few other locations in Italy could offer: the small in bloom garden, the old building, the intimate and romantic atmosphere, the lake and the San Giulio Island. 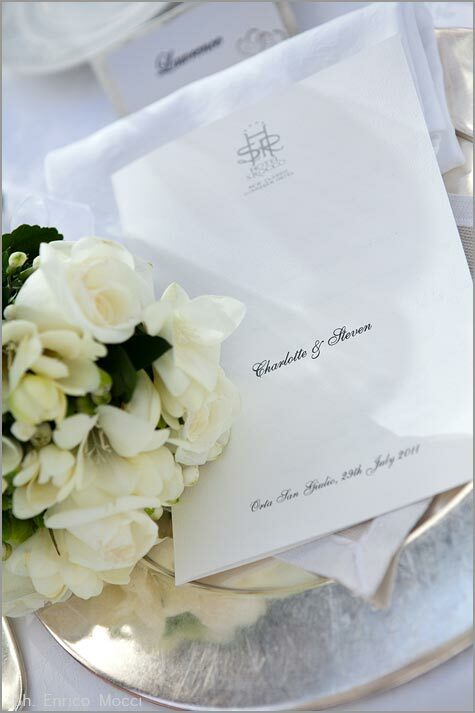 Every detail helps to make unique a service at Villa Bossi! 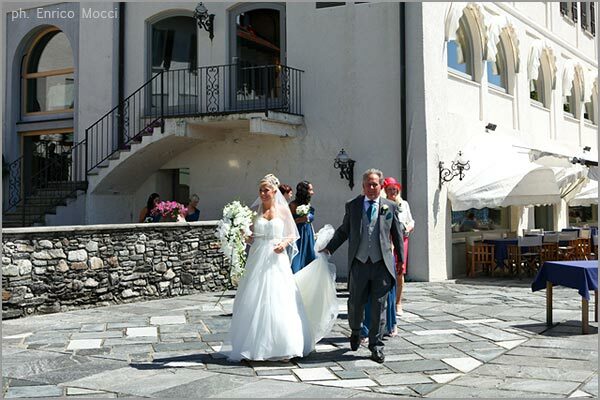 After the service, here is the married couple walking through Orta – followed by the indefatigable Enrico Mocci, the photographer choosen by Steven and Charlotte to immortalize the best moments of their marriage. 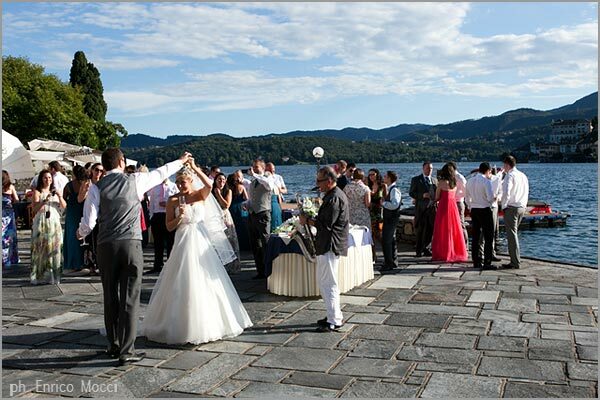 About the mini cruise of Charlotte and Steven, with all their guests, we have already commemted you in the post Love Boat, a romantic wedding… cruising with the navigation of Lake Orta. 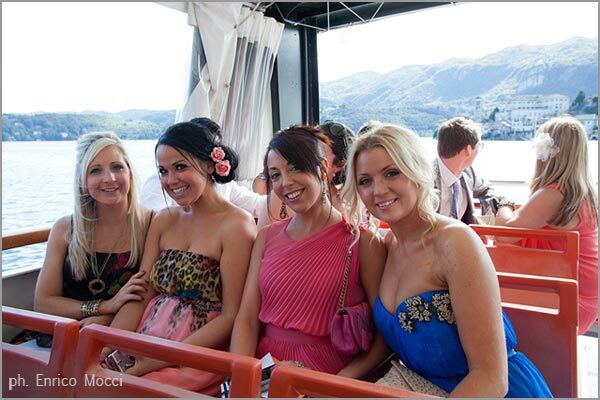 It was a really nice and original choice that we suggest to the couples who are planning to get married at our lake! 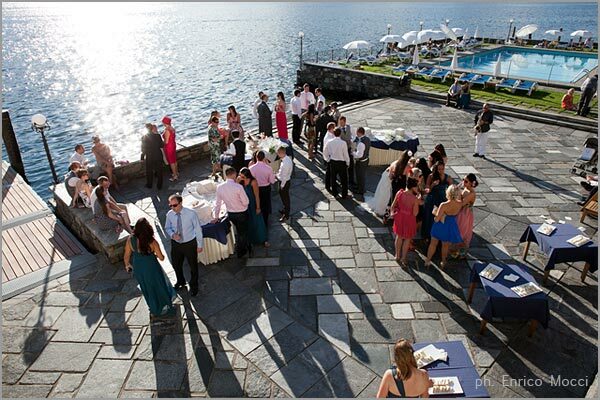 The final destination of the tour by the boat Ortensia was the Hotel San Rocco, where the married couple and guests were expected for a rich cocktail party by the lake, accompanied by the inviting music of the saxophone of Giancarlo Ellena. 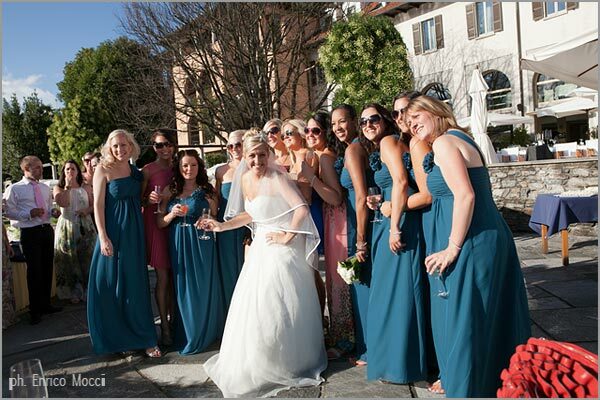 Another good reason to choose the Hotel San Rocco is the VILLA GIPPINI which is an elegant eighteenth-century building next to the hotel with its romantic garden overlooking the lake with the background of the picturesque palace on one side and the Island of San Giulio on the other, Villa Gippini is the perfect place to shoot beautiful pictures of your wedding on Lake Orta! 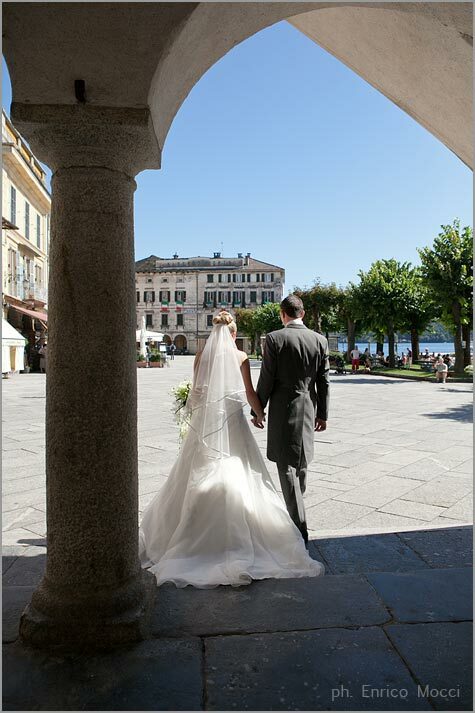 Of course it could not miss the photo of the married couple with the wedding cake, the lake and the background of the San Giulio Island! The bridal bouquet with Phalaenopsis orchids, and all the floral decorations of this event have been created by Monika and Paola, who are the floral designers of La Piccola Selva. 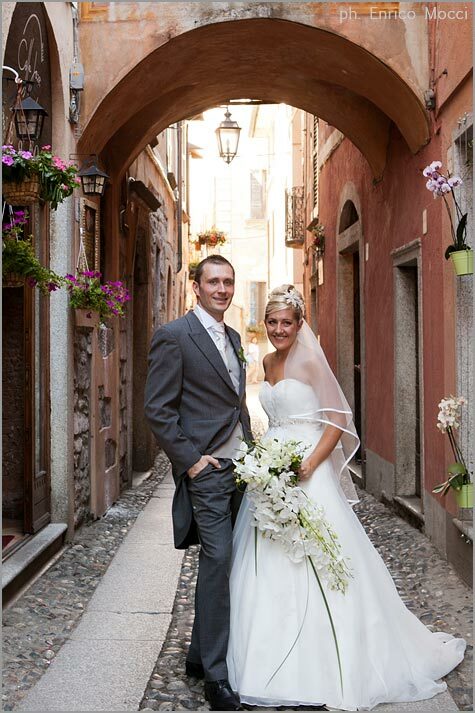 In this post on www.lapiccolaselva.com you will find all the details of the flower arrangements created for the marriage of Charlotte and Steven. The evening is coming… it’s dinner time! 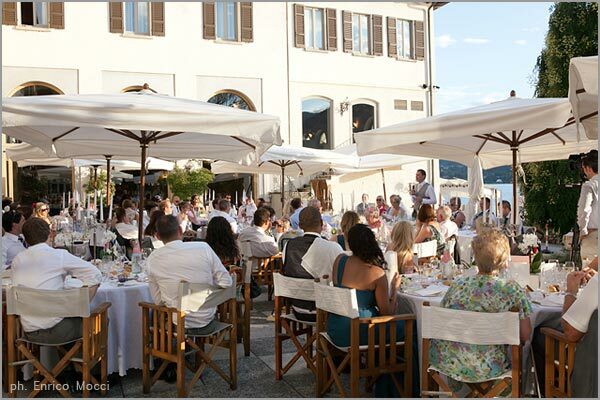 First the ritual speeches… and then let’s enjoy the delicious specialties prepared by the Chef of the Hotel San Rocco! 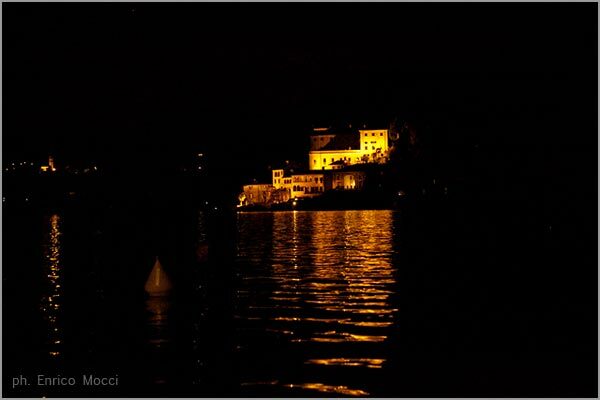 When night falls it’s time to dance… with the San Giulio Island that watch from far off bringing joy with its lighting. 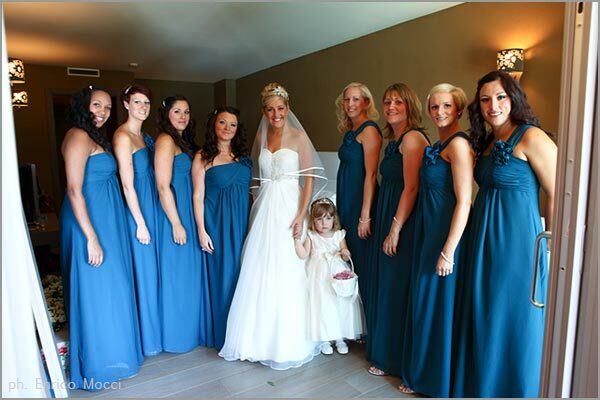 A simply perfect event, that one of Charlotte and Steven marriage celebration. 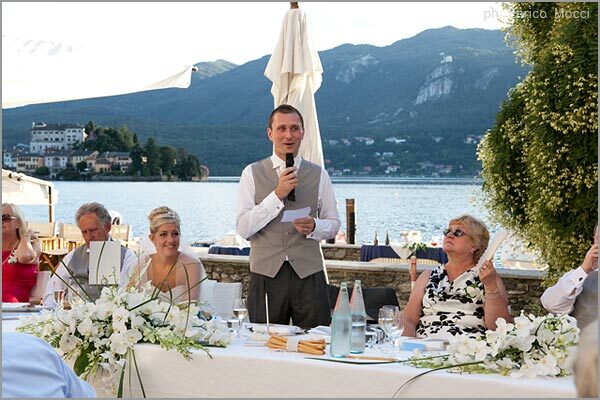 If you are thinking to get married, if you were thinking of Orta as the destination for your wedding and if you still have some doubts… Charlotte and Steven memories may definitely convince you! ← Stefania and Leonardo, a couple on Seventh Heaven!